The more you know about how your affiliate mailer partners interact with your suppression data, the more effectively you can manage your marketing efforts. OPTIZMO™ profiles EVERYTHING, allowing you to view your daily Opt-Outs and to view Opt-Outs within a date range in order to give you more insight into unsubscribe trends. Whether you want to see which seasons or times of the year generate the highest Opt-Out volume or isolate your analysis to specific days of the week, OPTIZMO lets you know. The benefits of trend analysis features within OPTIZMO include the ability to determine when recipients are opening their emails, unsubscribing from specific email offers, and determining days of the week when consumers are most likely to engage with your messaging. 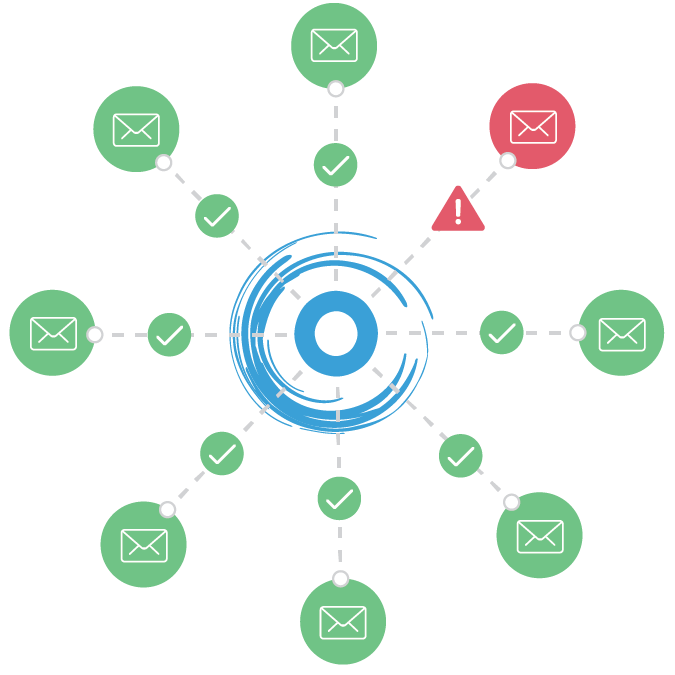 OPTIZMO has actively worked toward creating a platform that not only enhances the sustainability of acquisition email marketing, but also provides a high level of consumer protection by allowing consumers to directly send us the email offers they are receiving and to register valid complaints if the recipient is receiving emails after they have opted-out. OPTIZMO takes this a level further by letting the recipient know that they can only register a valid complaint if 10 days have passed since they first unsubscribed and checks the lists to let them know if/when their Opt-Out was first received. All suppression lists distributed through OPTIZMO are uniquely seeded with email addresses intended to bait and capture suppression file abuse. When a seed address receives an email offer, an alert is generated and automatically sent to a predesignated OPTIZMO user within your system settings. Included information within seed hit alerts include: time/date stamps of when the alert was created, the offending mailer ID or Sub-ID, when the mailer last downloaded the suppression file, the “from” address and subject lines, and a history report of past seed hit offenses. 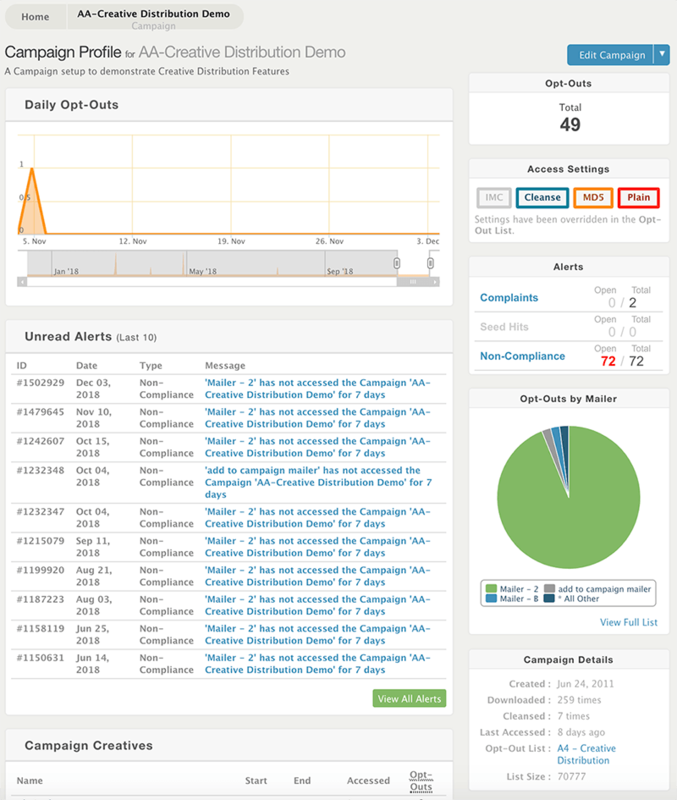 Whether simply adhering to the CAN-SPAM Act’s 10 day grace period for honoring unsubscribe requests from recipients OR creating more stringent internal business rules for honoring unsubscribes, OPTIZMO allows you to set the frequency at which your affiliate partners should be downloading your suppression files. If for any reason, your affiliate or channel partner does not access your lists within specific campaign offers, OPTIZMO notifies you and thus provides you with the awareness you need in order to reach out to and resolve this non-compliance issue with your mailer. Because of the relational hierarchy unique to OPTIZMO users, you have the ability to cross-reference a variety of data points within each profile segment of your email offer at the Opt-Out List level, the Campaign level, the Mailer level, and the Mailer within a Campaign level. As an example, if you’d like to see how many unsubscribes an affiliate partner or mailer has generated within a specific email campaign offer, along with the last time a mailer accessed the list associated with that specific campaign and the frequency in which downloads of that specific list has occurred, you have all of that intel at your fingertips. Sometimes Mailers send non-compliant emails to their email lists — either not honoring a prior Opt-Out request or possibly using unapproved creative. OPTIZMO requests creative from recipients who submit a complaint and make that creative available for Advertisers to evaluate, improving future compliance and protecting your brand image.